William Allegrezza edits the e-zine Moria. He has previously published many poetry books, including In the Weaver’s Valley, Ladders in July, Fragile Replacements, Collective Instant, Aquinas and the Mississippi (with Garin Cycholl), Covering Over, and Densities, Apparitions; two anthologies, The City Visible: Chicago Poetry for the New Century and La Alteración del Silencio: Poesía Norteamericana Reciente; seven chapbooks, including Sonoluminescence (co-written with Simone Muench) and Filament Sense (Ypolita Press); and many poetry reviews, articles, and poems. C. Derick Varn: What led you to co-edit an edition of modern and contemporary Chilean poetry? William Allegrezza: Two things. First, I have a long-standing interest in Chilean poetry. It has always amazed me that a country with fewer people than a large metropolitan area like New York or Mexico City has managed to produce so many amazing poets. Neruda, de Rokha, Parra, Mistral, Huidobro, Zurita, Urriola—the list could easily go on. It seems like a breeding ground for poetry like few places I know. Second, it is hard to find translations in English of contemporary Chilean poetry. Recently, some great translations of Zurita and a few other poets have come out, but it is hard for English speakers to keep up with what is happening in Chilean poetry. Galo Ghigliotto, my co-editor, is a significant part of the contemporary poetry scene in Chile, so I knew that if I teamed up with him that we could produce an anthology of living writers that would give a good view of what is currently happening. What do you see as Chile’s unique characteristic contributions to modern and contemporary poetics? Neruda has influenced writers all over the world, both in his period and up to now. I recently went into an American bookstore, and he was one of only two poets to have more than one book on the shelf. That included North American poets. His work also influences Latin American poetry as a whole, but other Chilean writers have as well, like Mistral and Zurita. Many times, I have heard poets say that Neruda’s poems like “Ode to My Socks” helped them realize that poetry could be about anything. Beyond Neruda, Chilean poetry, like much Latin American poetry, is much more political than poetry written in English. Zurita’s work feels epic in its response to Pinochet’s regime, and many contemporary poets, including some in our anthology like Héctor Hernández Montecinos, try to engage in contemporary Chilean politics. Still, Chilean poetry debates mirror what is happening in much Western poetry with groups arguing for innovative work and groups arguing for traditional form. Ultimately, I suppose that Chile’s unique contributions are through the influence of individual works—the anti-poems of Parra, Zurita’s Purgatory, and Neruda’s poetry in general. What do you see as Chilean poetry’s overall relationship to Anglo-French modernism? For many Chilean poets, during what we refer to as Modernism, French poetry was perhaps the most important influence. Chilean poets visited France and took on the French influence. This influence can easily be seen in the writers like Neruda, Huidobro, and Parra. Neruda, after all, was at one point the Chilean ambassador to France. More recently, the focus of Chilean poets has shifted more towards English language poetry. Pound is big influence on Chilean writers, as are the Beat poets. 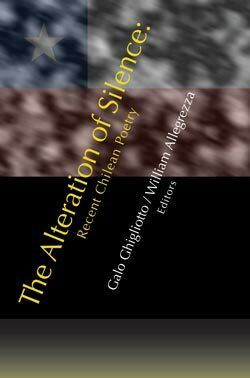 In fact, the companion anthology to this one that Galo and I published a few years ago in Chile, La alteración del silencio: poesía norteamericana reciente, was put together because Chilean poets are interested in other North Americans poets beside Ginsberg and Pound. We put together a book of twenty-five living poets from the United States to provide more reading material. Do you think that Neruda sometimes overshadows other key Chilean poets, and perhaps gives a skewed view of the tradition? In Chile, he did, but that period is mostly over. So many other great poets have written since he died. Outside of Chile, his work definitely skews the view. In fact, I suspect that in many English-speaking countries, he is probably one of only Chilean poets known. Do you think the French influence on early 20th Chilean poetry overshadows that of Spain? It is hard to say that it completely overshadows the Spanish tradition, but it provided an influx of experiments that reinvigorated Chilean poetry. It did much the same for other Latin American poetic traditions. What do you make of Nicanor Parra influence on modern poetry? Galo Ghigliotto discusses this topic a little in his introduction to our book. Essentially, he sees Parra as an influence who opened up an innovative tradition in Chile, one that helped Chilean poets move past the heavy influence of Neruda, and I hold the same view as Ghigliotto. Parra experiments with form in ways that pushed other Chilean poets to do the same. His work with Enrique Lihn is still a motivating force for innovative poetry in Chile today. Basically, he is a shaping force for postmodern poetry in Chile. What specifically do you think contemporary poets writing in English can learn from Chilean poetry in the early 20th century? One thing is a general current in Chilean poetry, and that is its concern with politics. Poets in the U.S. have on the whole avoided too much politics in their works, but in Chile, the poets engage the political world. The poets have also engaged the public more freely with innovative poetry. It has not been as confined to academia, journals, presses, and reading series as it has in the U.S. Beyond that, the recent history of Chilean poetry mirrors what is happening across the West in poetry, and because of its scale, it is a good way to see what is happening all over. And what do see published in Chile right now that you think is under-read and exciting? Raul Zurrita’s work should be more widely read. His work is both poetically and historically important. Jaime Huenun, Carlos Soto Roman, Leonardo Sanhueza–these poets all have work in the anthology and deserve a wider readership, but most of the writers in the anthology also deserve a close look outside of Chile. That is part of the reason that I wanted to be a part of the anthology. Chile has a vibrant history as a country of poetry, and that tradition is continuing. I hope the anthology acts as a jumping off point into the wider poetic field in Chile.